COSTA MESA, CA. 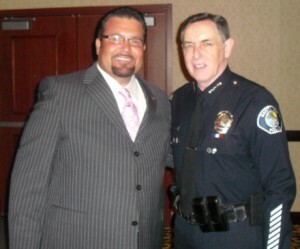 – David L. Boyd, a Trustee serving on the Orange County Board of Education, will request at the May meeting of the Board a briefing by legal counsel on what constitutes a hostile work environment as well as an investigation into the conduct of another trustee. 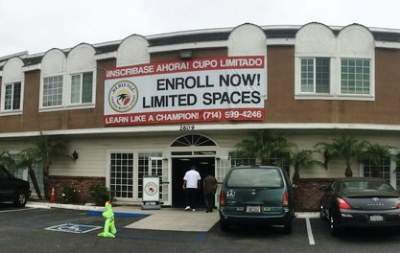 SANTA ANA, Calif. – August 28, 2015 – Vista Charter Public Schools, the operator of a high- performing school in Los Angeles, will host a Grand Opening for Vista Heritage Charter Middle School on Friday, August 28, 2015 at 10 a.m. at 2609 West 5th Street, Santa Ana, CA 92703. 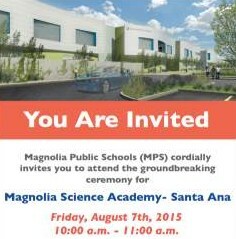 The Magnolia Science Academy, which was chartered by the Orange County Board of Education after it was rejected by the SAUSD School Board, is hosting a groundbreaking ceremony on Friday, August 7, 2015, from 10 a.m. to 11 a.m., at 2840 West 1st Street, in Santa Ana. Light Refreshments will be served at 9:30 a.m. Parking will be available on-site. Poll: Who is Santa Ana’s 2012 Man of the Year? 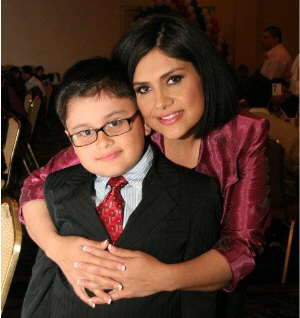 As has been our tradition, it is time to vote for the Santa Ana Man and Woman of the Year, for 2012. And we have quite a few great choices to choose from, in our poll below. You can vote for up to three nominees. Voting will close on January 8, 2013. This year’s mayoral race produced three of our nominees – Mayor Miguel Pulido, and candidates David Benavides and George Collins. But we also delved into our city’s non-profit sector to find stellar nominees Dwight Smith, of the OC Catholic Worker; Armando De La Libertad, the Director of the Delhi Center; Scott Overpeck, of the awesome community project Laundry Love; Scott Glaab, the head of the Santa Ana Athletic Foundation and a local high school wrestling coach; and Benjamín Vázquez, of El Centro Cultural de Mexico. 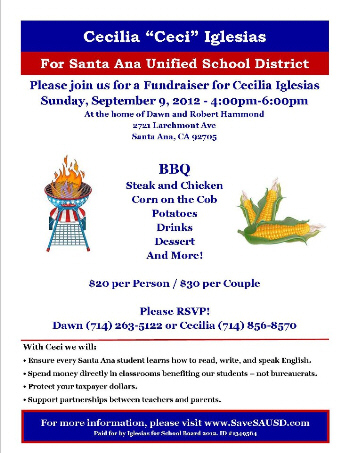 Cecilia “Ceci” Iglesias, a Republican candidate for the Santa Ana Unified School District’s Board of Education, is having a BBQ fundraiser this Sunday, Sep. 9, from 4:00pm until 6:00pm, at 2721 N Larchmont Ave, Santa Ana, at the home of Dawn and OC Board of Education Trustee Robert Hammond. I am not sure why exactly SAUSD Trustee candidate Cecilia Iglesias returned to the Republican Party, but she did and tonight she was rewarded by the OC GOP Endorsement Committee with an endorsement. The value of that endorsement aside, what she had to go through to get that endorsement is worth reviewing. The Lincoln Club of Orange County’s State and Federal Political Action Committees have issued a primary election Orange County voter guide, and it is a stunning slap to the Republican Party of Orange County’s slate of candidates in Central Orange County. 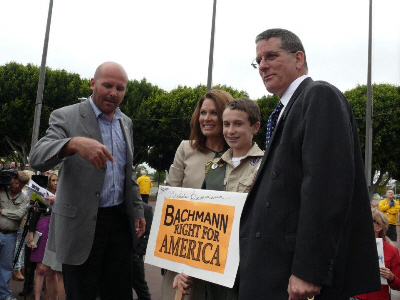 As reported in an earlier post today, Republican Robert Hammond has withdrawn from the race for the 69th Assembly District, according to the OC Political Blog. He is running instead for the Orange County Board of Education, in the First Area, which is being vacated by the incumbent, Long Pham. Republican Robert Hammond, a resident of Santa Ana, has withdrawn from the race for the 69th Assembly District, according to the OC Political blog. There are now four Democrats vying in the open primary, but only two of them have a shot at winning in June. Poll shows that Perez & Barragan should drop out of race for the 69th A.D.
A new phone poll of voters in the 69th Assembly District, conducted by Democratic candidate Tom Daly’s campaign, shows that newcomers Julio Perez and Francisco Barragan need to drop out now, or they are going to jeopardize the election of a Latino to represent this heavily Latino district, which is currently represented by Jose Solorio.